TENMAT were a Designated Supplier of Vent Duct Fire Sleeves (Olympic Village) to the London 2012 Games. 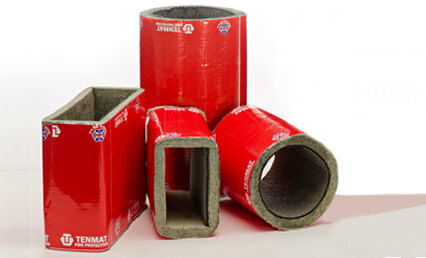 The TENMAT Vent Duct Fire Sleeves continue to receive widespread acceptance by Approved Building Inspectors, Local Authority Building Control (LABC) and the NHBC. The FIREFLY 109+ Vent Duct Fire Sleeves LP are suited for a variety of Residential, Social Housing and Student Accommodation projects. The product is available to suit 110×54, 204×60, 220×90, 100, 125 and 150mm ventilation ducts and can be used on multiple, side by side rectangular duct penetration including in solid walls and plasterboard partitions.